MICHAEL DOUGLAS in "Wall Street", William Hurt in "Broadcast News", Marcello Mastroianni in "Dark Eyes", Jack Nicholson in "Ironweed", Robin Williams in "Good Morning, Vietnam"
CHER in "Moonstruck", Glenn Close in "Fatal Attraction", Holly Hunter in "Broadcast News", Sally Kirkland in "Anna", Meryl Streep in "Ironweed"
SEAN CONNERY in "The Untouchables", Albert Brooks in "Broadcast News", Morgan Freeman in "Street Smart", Vincent Gardenia in "Moonstruck", Denzel Washington in "Cry Freedom"
OLYMPIA DUKAKIS in "Moonstruck", Norma Aleandro in "Gaby: a True Story", Anne Archer in "Fatal Attraction", Anne Ramsey in "Throw Momma From the Train", Ann Sothern in "The Whales of August"
BERNARDO BERTOLUCCI for "The Last Emperor", John Boorman for "Hope and Glory", Lasse Hallstrom for "My Life as a Dog", Norman Jewison for "Moonstruck", Adrian Lyne for "Fatal Attraction"
This was the 60th year of the Academy Awards. 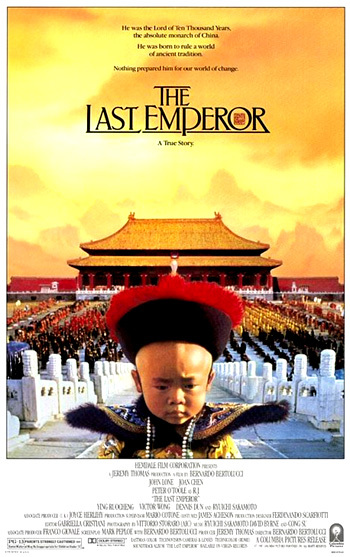 The 1987 Best Picture winner was Italian director/co-screenwriter Bernardo Bertolucci's Oscar-sweeping, big-budget, technically-brilliant film The Last Emperor (with nine nominations and nine wins! ), filmed both in Italy and China with a cast of thousands. The spectacular historical epic, shot in China's Forbidden City (the first ever), dramatized the life of Pu Yi (played as an adult by John Lone), China's last Manchu dynasty emperor (beginning at the age of three) who was deposed only three years later, and used by the Japanese to be the puppet ruler of Manchukuo. Its tagline was: "He was the Lord of Ten Thousand Years, the the absolute monarch of China. He was born to rule a world of ancient tradition. Nothing prepared him for our world of change." The film featured 19,000 extras and 9,000 costumes. It was the only film produced outside of America or Britain to have received the ultimate award for Best Picture; it was not considered a foreign-language film, however, and therefore was not nominated for Best Foreign Language Film. Bertolucci's win as Best Director (his first) was for his second nomination as Best Director (he was first nominated as Best Director for Last Tango in Paris (1972)). It was the first PG-13 rated film to win Best Picture, and the second of only three partly foreign language films (English/Mandarin) to win Best Picture (the other two were in 1974 and 2008). With Bertolucci's win, he became the first and only Italian filmmaker to receive a competitive Oscar. James L. Brooks was the only director of a Best Picture nominee who wasn't nominated for Best Director. In his place, Swedish director Lasse Hallstrom was nominated for the engaging, off-beat film My Life as a Dog (with two nominations and no wins) about a young 1950s Swedish boy. Michael Douglas, lead male star in Best Picture-nominated Fatal Attraction, won the Best Actor award (his sole acting Oscar to date) for his performance as the evil, big-time, hotshot, ruthless mid-80s capitalistic trader Gordon Gekko, known for the statement: "Greed is good," who uses underling Charlie Sheen as his insider-dealer in writer/director Oliver Stone's Wall Street (the film's sole nomination and win). Better known for his world-famous James Bond films, Sean Connery (with his first nomination and first Oscar) won the Best Supporting Actor award for his role as the wily, street-smart, honest, veteran 1930s Chicago beat cop, Irishman James Malone who teaches federal agent Eliot Ness (Kevin Costner) how to trap gangster Al Capone (Robert De Niro) in director Brian DePalma's re-working of the TV series in the film The Untouchables (with four nominations and one win). And Olympia Dukakis (with her first nomination) won the Best Supporting Actress Oscar for her performance as Cher's long-suffering, tolerant mother Rose Castorini who overlooks the affairs of her plumber husband (Vincent Gardenia) in Moonstruck. The classic children's fantasy The Princess Bride was almost completely ignored (with only one nomination for Best Song), and should have received consideration for Best Picture, Best Director (Rob Reiner), Best Screenplay Adaptation (William Goldman from his own novel), Best Actress (Robin Wright Penn as Buttercup, the titular Princess Bride), and Best Supporting Actor (Peter Falk as the Grandfather). Dire Straits band member Mark Knopfler, as he was four years earlier with Local Hero (1983), was again ignored for Best Original Score. Neither Jean de Florette (1986, Fr.) nor its sequel Manon of the Spring (1986, Fr.) were nominated for Best Foreign Film (Note: both films were released to the U.S. together in 1987). Gerard Depardieu's role as hunchbacked farmer Jean Cadoret from the first film went un-nominated, as did Yves Montand's role as the scheming Cesar Soubeyran in both films.